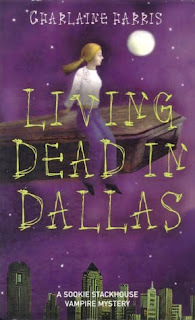 Pretty Sookie from small-town Louisiana finds herself in all kinds of sticky messes in Living Dead in Dallas. Right off the bat, her good friend from work is found murdered (yes that happens again) and she and Bill (and her mind reading abilities) have been farmed off to Dallas by Bill's boss, Sheriff of Nottingham - ah, I mean Eric, to find a missing vampire kidnapped by an anti-vampire cult. Trouble ensues.. I thought this one was better written than the first, it was quicker and more fast-paced, but I'm discovering Harris likes to wrap up her plot threads in the last page or two of her books. For instance, here Sookie's good friend is murdered in the first few pages, then we don't hear much about that again until the very end of the book. I kept wondering what happened. Like Harris must've been, I'm losing interest. Fast. In Club Dead, Bill becomes distant and disappears for most of the novel, and in grand Harris tradition you're not going to find out what happened to him until the very end. But did I mention that this one was my favorite so far? Eric thinks he knows what's happened, and he and Sookie leave town again to try and find Bill, even after I tried to will them to stop. 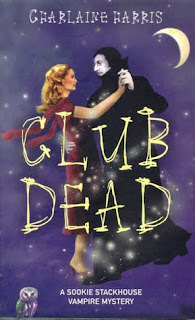 Throw in another hot werewolf and you've got, Twilight, no I mean good times at Club Dead! Sookie really comes into her own in this novel. She's getting stronger, more independent and while getting to the root of her problems, actually tries to solve them - all by herself. A novel concept! You go Sookie! Sookie's getting quite popular. the latest book in this series, "From Dead To Worse", is #5 on the NYT Best Sellers list for mass-market paperbacks. I noticed that too, it's probably because of the series on HBO. I remember seeing the covers of these books, but not picking them up for whatever reason. And I think I like it best of all because most of them were written before Twilight - a series I'm not really a fan of. So no, Meyer didn't invent the whole human falls in love with a vampire and werewolf theme. LOL at the Edward Cullen remark. Clap! Clap! Yeah, I couldn't help myself! I thought I'd put a wooden stake to all these vampire books until I read these. Pure cotton candy! I haven't read Sookie yet. Sounds really interesting in the way you've put reviewed it though. I've only read Twilight and I'm still attempting to read New Moon. I get razzed about it a bit that I just can't seem to finish it. I'd like to before the movie comes out. I might like these books too. Good grief I'm glad someone voted for Bill! The first book in the series was just okay, but they are improving so far, I'm on number six. Definitely more grown up than Twilight that's for sure. You should try out the first few and see what you think.